Amico & Co Reveals Plans for Operation Expansion – Superyachts News, Luxury Yachts, Charter & Yachts for Sale. 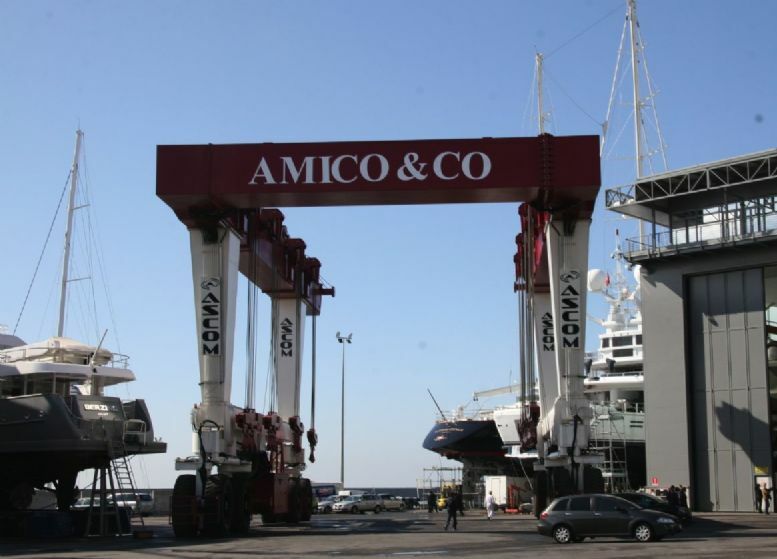 Amico & Co, based in the important maritime center of Genoa, Italy, is renowned for its excellent superyacht refitting services across the yacht industry. But to retain its position in this aggressive market the company had to move a step ahead and look to newer options like the brand new 835 tonne travel lift, allowing the firm to broaden their horizon in the yachting industry. This 835 tonne lift is believed to facilitate the task of refitting for the shipyard on their hard standing area besides increasing the number of yachts for repairs. This travel lift made by Ascom SpA and costing around two million Euros is able to haul out yachts of 60m LOA. The company organized a celebration which consisted of a champagne reception in one of the refit locations managed by the yard’s founder Albert Amico. Before Albert gave details about the major figures at the yard and revealed some testimonials of the former clients, the spectators were shown a presentation (a video). This video show briefed on the background of the company, the overall work, and philosophy of the shipyard. For instance, the captain of the 53 Perini Navi sailing yacht Independence explained how it was like working on the impressive Amico yard and its benefits. He further added in his account the important factors like close supervision given to achieve better results and quality nature of work which made everyone choose Amico. Besides this, they were also attracted due to the firm’s commitment to the future by investing in technology such as the lift. The presence of the two local politicians competing for the next elections for the regional government (Regione Liguria) at the show made it evident that the Amico Shipyard is highly sought after in Genoa and the wider region. Others who made the event highly prestigious were Anton Albertoni of UCINA (Italian Marine Industry’s confederation) and Musso Enrico (an Italian Senator). In the words of the ex-owner of Felidan, Mr Grossberg who had used the yard on many occasions, it helps businessmen to figure out opportunities in situations of crisis. Alberto Amico’s investment in this shipyard has benefited many businessmen in resisting difficult times and coming out as a winner. The travel lift of Amico & Co. has arrived quite on time to skim the refit market which is buzzing with a lot of activities. At present, the sector of refit of the larger superyacht industry is expanding in significance and size, both. Better plans of investment in this segment can reap greater shares. With almost 3879 yachts sailing on waters, almost 71% of them being more than five years old demand the services of this industry. Moreover, this is an incredible way for enhancing revenues and lowering the overheads compared to the other option of expensive government owned dry docks.